Franz Peter Schubert (1797-1828) is considered to be the last of the Classical and one of the first Romantic composers. His oeuvre has been extensively performed and recorded all over the world for two centuries. The British pianist Leon McCawley (born in 1973) won First Prize in the International Beethoven Piano Competition and Second Prize in the Leeds International Competition in 1993. He is a frequent soloist with many notable orchestras as well as performing in chamber music. His wide-ranging discography deserves the highest accolade. 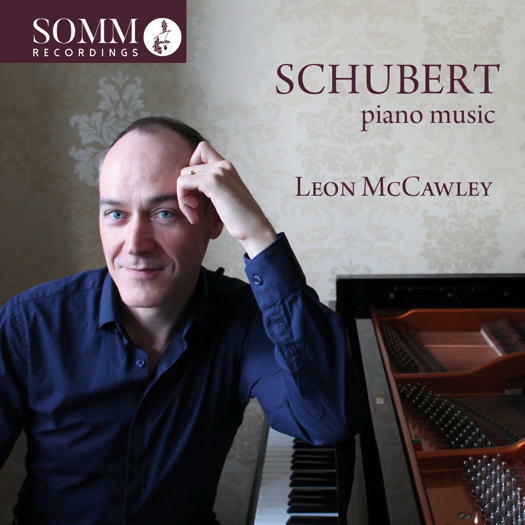 On his newly released CD, Mr McCawley performs a selection of Schubert's most well-known works. The composer wrote Drei Klavierstücke (D 946) some months before his death. However, these three masterworks were first published only forty years later in 1868. The editor was no less a person than Johannes Brahms himself. The former's impromptus and songs, as well as the latter's intermezzi, for example, were and are justly popular pieces amongst performers and audiences alike. The E flat minor, E flat major and C major works are blends of delicate romantic emotions. Having listened to them numerous times I knew that - both literally, as well as figuratively - they were in good hands. Leon McCawley's singing melodic lines are supported by translucent, softly played harmonies. These components combine to give a meaningful, eloquent performance. According to Liszt, Schubert was 'the most poetic composer' he had ever heard. The two composers could theoretically have met, but they did not know each other personally. Liszt loved and was so enthralled by Schubert's lieder that he transcribed many for piano. In these Liszt was able to preserve the hidden meanings and characteristics of Schubert's original material. Thus, in these arrangements pianists have to cope with two demanding tasks: to ensure that the unique Schubertian atmosphere prevails and, at the same time, to cope with Lisztian technical challenges. Mr McCawley superbly interprets five of Liszt's arrangements (S 558). In Sei mir gegrüsst (I greet you), Die junge Nonne (The Young Nun), Du bist die Ruh (You are the Rest and Peace), Auf dem Wasser zu singen (To be sung on the water) and Der Wanderer (The Wanderer) he proves that he is a master of conveying majestic feelings. His unique touch, articulation, expressive dialogue between hands and outstanding technique are admirably illustrated in virtuoso passages which demonstrate his remarkable sense of style. This recording offers many memorable moments for the listener. The above mentioned Der Wanderer transcription both thematically and musically prepares the Wanderer Fantasy (D 760). Schubert wove one of the original lied's motifs into the Fantasy - hence its name. As there is an abundance of technically demanding passages in the four-movement piece, it is considered to be Schubert's most difficult masterwork. The composer himself said, 'The devil may play it!'. Indeed, viruosity, passion and energy sweep through Leon McCawley's polished Wanderer performance. I have always admired Schubert's wonderful music. It is only recently that I have focussed more on his distinctive compositional style and interpretation. I am sure that McCawley's impressive playing has brought new meaning to many others seeking to elucidate the music of this great composer.